After watching it start out small, grow in momentum, and become a gargantuan success that swept through award season, I, at long last, have now seen The King’s Speech. So, you know, never mind all those critics and all those awards … the most important opinion of all is now available. Are you ready? Probably not. Ahem. The King’s Speech is a historical drama about the events leading up to and immediately following the coronation of King George VI of England. 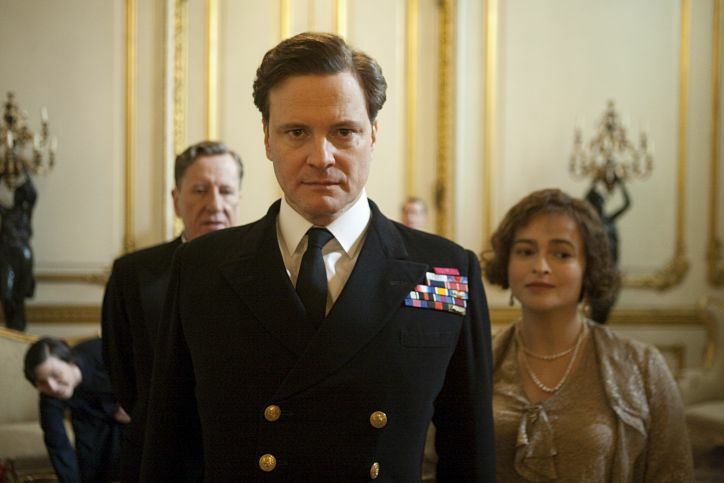 Prince Albert (Colin Firth), Bertie to his family, is the younger brother; he’s second in line to the throne behind his brother Edward (Guy Pearce). As such, he isn’t really interested in his share of the limelight although it is often thrust upon him by his father the king (Michael Gambon). See, the problem is, Bertie stutters. And for a public figure expected to speechify upon occasion, that’s a problem. Bertie’s been through every speech therapist in the country, practically, and has given up. His wife Elizabeth (Helena Bonham-Carter), however, is more determined, and seeks out an unorthodox practitioner named Lionel Logue (Geoffrey Rush). Lionel and Bertie struggle through a working relationship amidst King George V’s death, Edward’s rise to the throne and subsequent abdication, and Bertie’s being crowned George VI. The culminating moment of the film is King George VI’s radio broadcast on the day that Britain goes to war with Germany at the beginning of World War II. First things first: did you get a load of that cast? Fabulous! Add in the absolute perfection that is Derek Jacobi as the Archbishop of Canterbury, Timothy Spall as Winston Churchill, and Jennifer Ehle as Logue’s wife, and the movie is just a dazzling who’s who of British (or British-ish) acting talent. Obviously, any movie starring the triumvirate of Firth, Bonham-Carter, and Rush is going to be excellent, and The King’s Speech is indeed excellent. It is a very intimate piece: emotional, humorous; overall an excellent depiction of the inner life of royalty, and at its core the story of a friendship. The relationships are indeed the movie’s greatest strength. Bertie and Elizabeth’s marriage is seen as truly loving and supportive, and the relationship between Bertie and Logue, while often a struggle, is one ultimately built upon mutual respect and affinity. Colin Firth is absolutely amazing in this movie. It’s hard to believe that he doesn’t stutter in real life, and his wry delivery is really enjoyable. Bonham-Carter is a fascinating mixture of warmth, depth, and that stereotypical stiff British upper lip. Geoffrey Rush was, for me, the emotional center of the piece. His Lionel is unfailingly positive, capable, and determined in his methods. His refusal to treat Bertie as royalty is so uncomfortable to watch, but is ultimately the key to the king’s success. The chemistry between the two actors is really spectacular, and obviously the supporting cast makes no missteps either. In case you haven’t picked up on this vibe yet, the acting is what makes this movie. It’s also very well-directed and filmed, with interesting use of close-ups to convey the pressure and comfort level of Bertie, in particular. Period costumes are always enjoyable, and I have nothing bad to say about a score that makes such use of Beethoven. But the story itself, and the pacing of the film, leave a little to be desired. It’s a little slow sometimes, and there are points where the scene and action shifts, and the viewer has to make a bit of a leap to catch up. In particular, the skip from King George V being hale and hearty and yelling at his son to being mumbling, confused, and close to death was rather jarring for me. I think it’s just a failing of this type of close drama: there’s not a lot of action, so it’s harder to keep things moving at a comfortable pace. It detracts only slightly from the film overall, since it’s all about the performances, but it’s still there. As such, my husband and I both looked at each other at the end, and said “Hmm. The Social Network should have won Best Picture.” Yes, I know, neither of us is a voting member of the Academy. But there it is. They’re very similar movies in some ways: both based on real events and people, both more talk and less action. But the tightness and cohesiveness of The Social Network is far greater than that of The King’s Speech. The story of Facebook’s founding, which sounded so boring to me prior to seeing the film, is somehow rendered fascinating and riveting through Aaron Sorkin’s writing and David Fincher’s direction.I won’t go on and on about it, (you can read my review here), but that’s the opinion of this random denizen of the internet. The King’s Speech is far superior in terms of acting (which is not to say that TSN wasn’t well-acted), but as a film in its entirety, it’s not as impressive. Does that mean I don’t think you should watch it? Absolutely not! It’s a really, really enjoyable film, certainly one of the best I’ve seen recently. You should totally see it. It’s touching, funny, intense at times, and educational. What more could you want? Colin Firth? There you go! Wahoo! Glad you finally saw this, Sam. I totally agree with you that the friendship story is what makes the film. It’s what sets this apart from other British royalty movies. In hindsight I feel that Rush perhaps deserved that Oscar win, and if the constantly-passed-over Bale wasn’t on the running I’d have rooted for Rush in a heart beat! As for whether the film itself deserved an Oscar, well, even w/ all the flaws I still think yes, it does. There are worse films that have won best films in the past. As for Best Director, it should’ve gone to Fincher, no question there. Fantastic review of a great film. Yes, I highly recommend this one, too! I liked this especially the first time I saw it but you are right, this wasn’t really worthy of an Oscar. It didn’t blow my mind but I guess all the other contenders last year didn’t either. Thank you for this thoughtful review Sam, you completely surprised me actually. You started out sounding a bit like a marketing exec for the film but then you challenged me by your assertion that The Social Network was a better film. I can see where you’re coming from on this one. The Social Network is superbly written and distinctively directed, plus the soundtrack is killer. Having said that when I told my wife what you said she was surprised. I think The King’s Speech is better because the message and the feeling surpass The Social Network’s technical proficiency. I haven’t seen The Social Network, so I cant really judge between the two. But I absolutely LOVED The King’s Speech. Good review. For what it’s worth – I would have had either The King’s Speech OR The Social Network winning the Oscar. I felt both Toy Story 3 and The Black Swan were superior movies among the nominees.